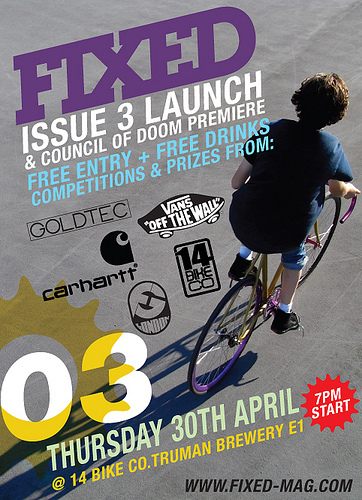 Looks like the Fixed Mag 3 launch will be happening this Thursday at Shop 14 and that they will also be premiering Council Of Doom at 7pm. It’s FREE and ALL are welcome. See you there for a beer or five. There will also be prizes from Vans, Goldtec and 14 Bike Co. I’m not sure what you have to do to get one though. Maybe there’ll be a tricks contest outside the shop or a raffle? Apparently Superted has designed some new Goldtec hubs though I’m not sure if the prototypes have come through yet.